I just corrected my Spanish 1 midterm exams and every student (except one) earned an A or an A+ on the exam. I actually brought them to a French classroom to take the test so that they could not read any words on the wall. Everything they wrote came from their own hearts. That one student who did not get an A was a student who often missed class and substituted the class experience for written “make-up work”… something that my district requires that I offer for all excused absences. Before I made the switch to TPRS I used to brace myself each year for the inevitable dip in grades caused by final exams. I would console my highest-performing students explaining that, due to the comprehensive nature of the exam, it was “normal” to score a full letter grade worse than their class average. With the long lists of vocabulary and grammar concepts it was taken for granted that they would not remember everything I taught. I occasionally assigned projects to “pad” their grades, and despite the laughter and crazy moments that were always part of my classes I often wondered why many students ended the year disappointed and disparaging of the progress that they had made. Thank you for sharing all of this info, Mike. I just bought your book ‘My Perfect Year’ and am halfway through. I love it and will finish it this weekend – an easy read. I have been looking for examples of a Proficiency Exam and these examples here are so helpful. My students are taking their end of tri exam right now and I want to cry because it’s all scan tron and traditional based – because right now that’s what I have to follow. 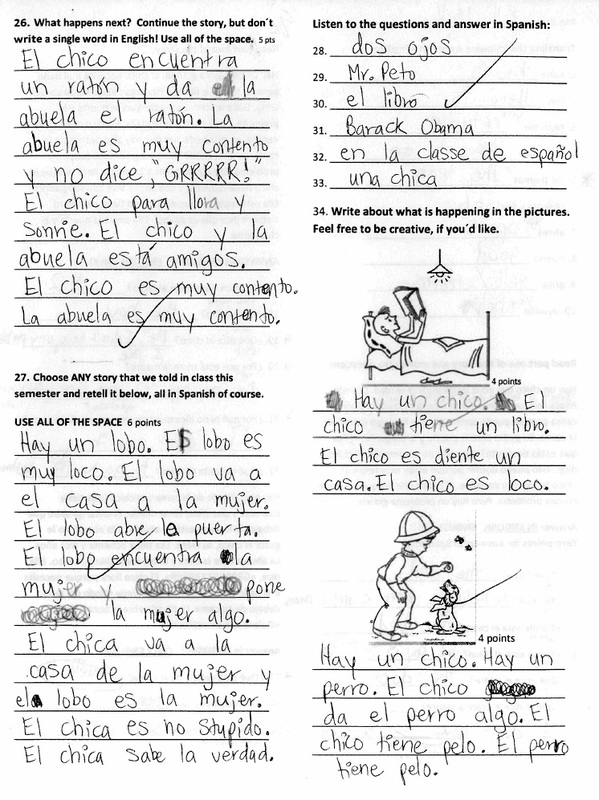 I have amazing students who would feel so much better about learning Spanish if they could learn the CI/TPRS way. Would you still use something like this? And is the story an old one or one they’ve never seen before? The story on the exam was brand new, but the words had been used in other contexts many times. I shared this midterm mostly for people who feel like they have to give more traditional midterm exams. 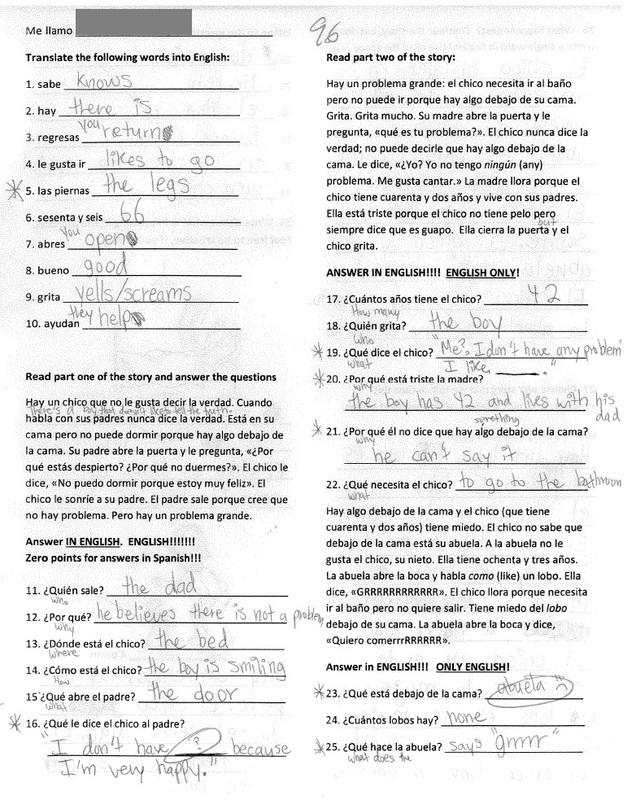 If I were in a department that was pushing common assessments, I think this exam would be an okay approach for Spanish 1. However nowadays, since I have total freedom in the classroom and my midterm does not have to resemble those of my colleagues, I have another approach. We have two hours for the exam, but we have less than 160 hours of instruction time per year. I am not going to burn time that could go towards good instruction. So we spend the first hour creating a new One Word Image (OWI) and then a short narrative. I do a write and discuss (W & D) of the story, I stand in the back of the room and ask for choral responses as my students are not looking at the board. Once everyone is ready, I erase the board and students take out a blank piece of paper. The first ten questions are oral comprehension questions about the OWI & story that we just co-created in class. The next 10 questions have to do with other stories that we have told in class and that they had recorded in their notebooks. None of the questions are tricky, especially the ones about past stories. If they reread their notes from W & D before the exam (I often have them copy the W & D into their notebooks) then there will be no problems because I always choose iconic moments from great stories. I have also already explained the format of the exam, so they know what is coming. Finally I have them write a 150 word slow write, they can take as long as they want to write it. It is from the slow write that I get a lot of feedback for my teaching. It is really hard to not get at least a B on the midterm. Thank you so much. I created my final exam based on this post. I was amazed at how well my students did! Thanks for sharing. I love this assessment. I am wondering if during the exam you left your question words and verbs posted on the wall? Thank you! Another question: how did you evaluate the ” 6 points” for the short answer/short story questions? I am sure I had some sort of rubric that has been lost. Those sections gave me a lot of good information about the kind of input that I needed to give more of in the second semester… that was more important to me than the points. As I read those sections I had a blank piece of paper next to me where I took notes about errors that I was seeing. That was not returned as feedback to individual students but rather for my own improvement as a teacher. Also, how do you define ” mid-term”? Was this middle of semester or middle of year? Back when I gave this it was end of semester. Gosh, it would be easy for my students nowadays, this could now be an “end of quarter” exam if I gave those. Congratulations! How rewarding! I am going to try something similar. I can figure out some of them, but what were your verbal prompts for the listening portion? Thanks! I noticed that strategy in the written questions. Thanks so much for sharing what you do! It is a big help to a new person.